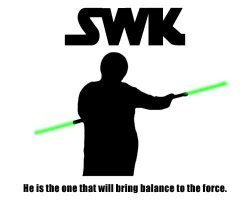 A new phenomenon has hit the ‘net...it’s called the Star Wars Kid. Imagine being a teenager and fooling around like you’re one of your favorite movie heroes. Now imagine it’s a Jedi Knight, one of those Star Wars heroes. Now imagine you have the vision (or lack thereof) to videotape yourself. Now imagine your friends get ahold of the tape and make it available on an internet file-sharing network, Kazaa. Ready? Mortified yet? Well, it gets worse. And better. For us, that is. Imagine people all over the net have taken that video and added their own special effects to it. Their own themes. their own music, etc. They’ve also morphed this kid into their own favorite blockbuster movies...there’s Lord of the Rings with the kid in it, The Matrix, etc. Now how would you feel? Ready to see the real thing? Click below to get started.